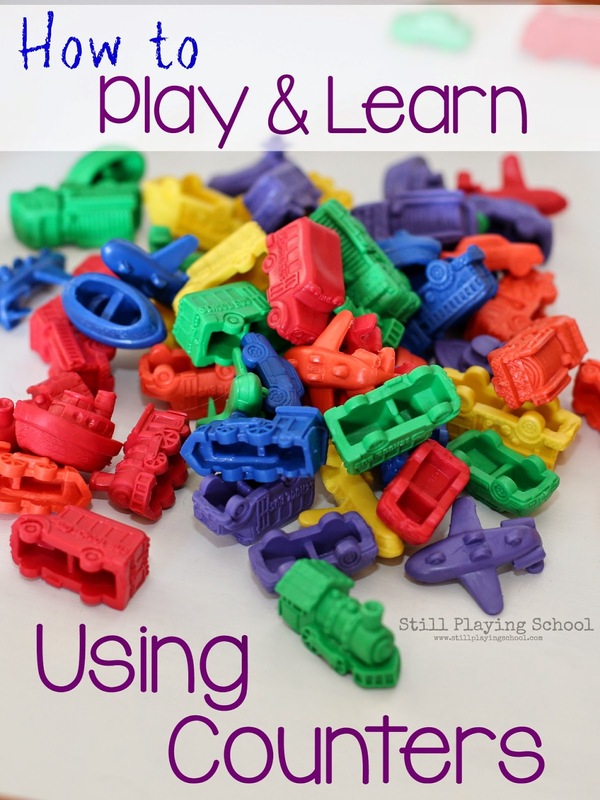 We love taking a theme that our children are interested in to drive our play and learning. We used vehicles to study math concepts including sorting, counting, and patterning. This week's Playful Preschool theme is Transportation. You can search each Wednesday for all posts on social media by using the hashtag #playfulpreschool! Yesterday I posted a sneak peek of this activity over on our Instagram! 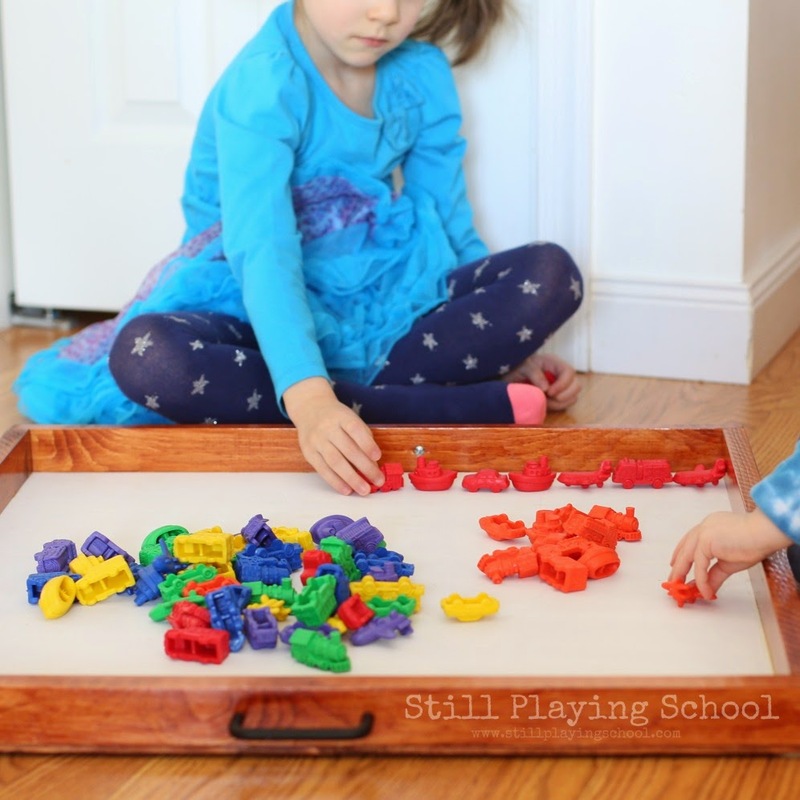 We love counters for a variety of play based educational activities! 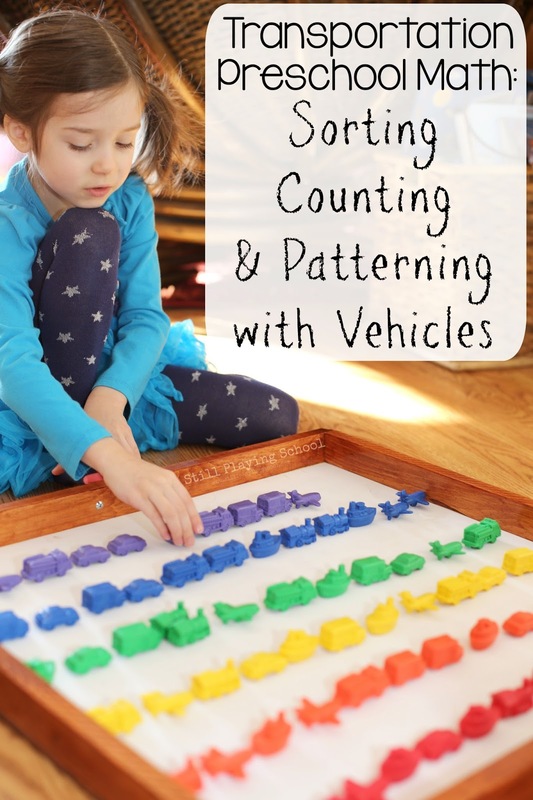 We are using vehicle counters for our transportation theme but you could also play and learn with farm animals, bugs, safari animals, pets, dinosaurs, or traditional counter bears. You could also utilize toys you already have like when we studied math with D's collection of Thomas trains! For this activity, we dumped our vehicle counters out on two trays. Without prompting our five-year-old and two-year-old, I observed what they were led to do first. Right away, five-year-old E started organizing the vehicles by color. Toddler D followed her lead as he is working hard to identify colors lately! Next E transferred the vehicles by type over to the other tray. 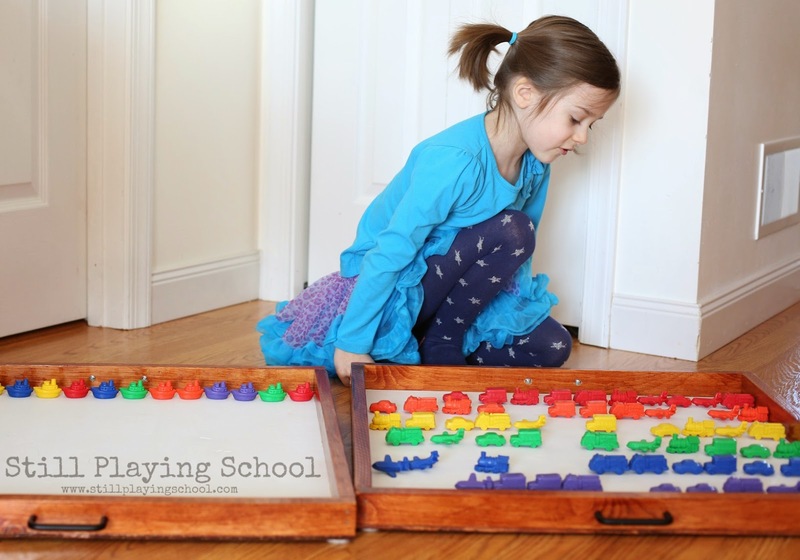 She systematically chose each boat from the color rows, then the trains, planes, and cars. We discussed how she was sorting by different attributes. At this point, I stepped in to direct the learning a bit by asking her to build and complete patterns with me. We started with basic AB color patterns but she quickly wanted to try to "trick" me by adding a third color or switching to a new vehicle and keeping the colors repeating as we continued. I love those counters! So colorful and detailed! I really like those counters. We have the counting bears, but I think my son would like these better. 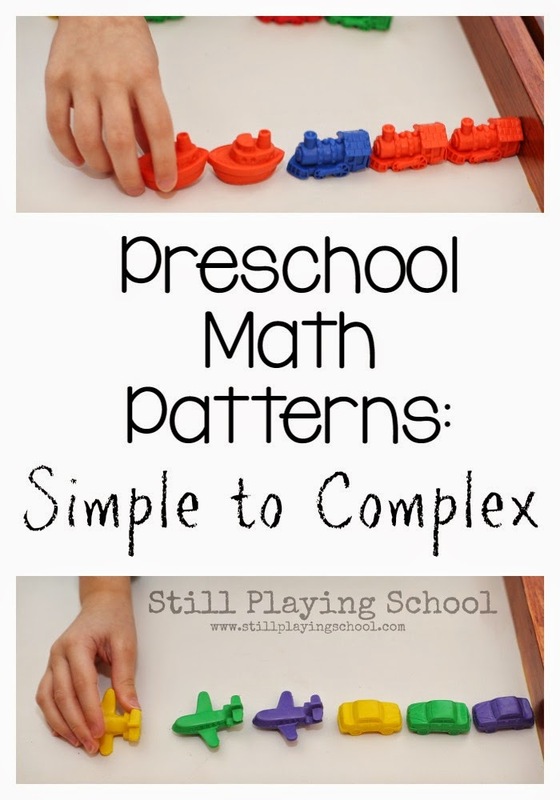 They lend themselves perfectly to a patterning activity like this! I love this counter set. My first child would have preferred a big pile and pretended to have the counters pretend play, but my middle child would line them up and sort them! Oh I must get this counter set! Love these counters! I love how you let them just play with them first and that the toddler was copying the sister. The learning process for the youngers is always fun for me to watch.